Marriage is an institution blessed by all religions. According to the Bible Proverbs 18:22; “He who finds a wife, finds a good thing and obtains favour of the Lord”. That same message is mentioned in the Quran Chapter 30:21: “And among His Signs is this, that He created for you mates from among yourselves, that ye may dwell in tranquillity with them, and He has put love and mercy between your (hearts): verily in that are Signs for those who reflect”. Sierra Leone’s presidential aspirant of the opposition Sierra Leone’s Peoples party (SLPP) has tied the knot. And there is no secret about this blessed union between the loving and happy couple. For me, whether you are a politician, professional, business man, civil society activist or ordinary person, in our religions and communities, Marriage has always been an institution based on family, love and care. These values ought not to be determined by tribal, religions or national origin. But at the same time as our socio-cultural lives change in a fast moving world, we must recognise that whilst many people believe in the values of marriage, there are others who because of their individual circumstances may have different opinions about marriage and we must respect those opinions as a society – as we have always done. 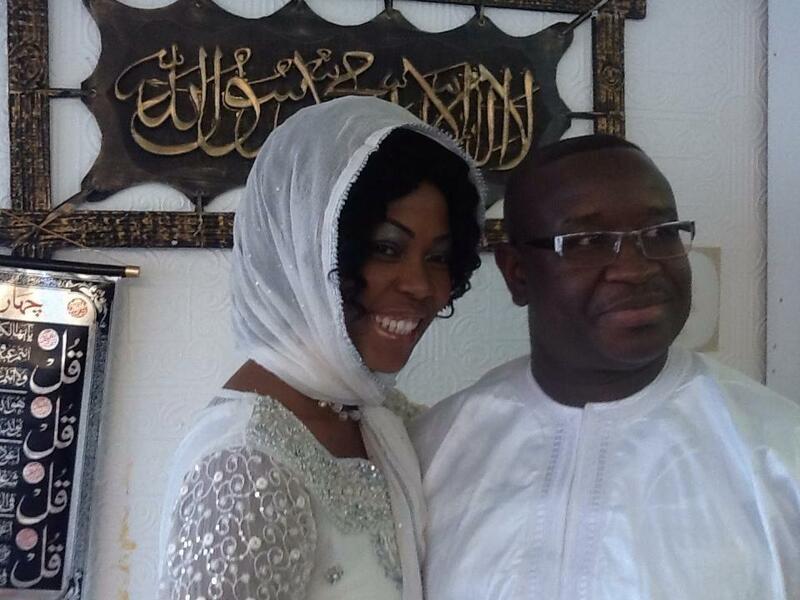 Media reports of a “secret” wedding between the Retired Brigadier Julius Maada Bio and Fatima Jabbie-Bio are nothing other than mischief making. Firstly, for anyone who knows Julius Maada Bio, despite his occupancy of the highest seat of state governance, has always been a private individual. As I have come to know Bio, he has always believed that everyone is entitled to the respect of their privacy, except where the conduct of their private life raises a question of public interest. Therefore, any allegation of a “secret” wedding of Julius Maada Bio is both mischievous and inaccurate. Bio is a private person and prefers a private wedding. And for anyone to suggest that Julius Maada Bio had embarked on a dubious wedding is very insensitive. Arguably the most popular politician in the country, every well-meaning Sierra Leoneans would love to wish a young, dynamic and responsible politician a happy marriage life. But ordinary people going through hardship know that they have far more important things in their lives than talking about title tattle. Julius Maada Bio’s preoccupation is about providing a strong leadership for the people of Sierra Leone in addressing the issues which affect their daily lives, such as the rising cost of living; accessing healthcare; providing jobs for young people; improving standards of education; providing electricity and safe drinking water. This task will not be affected by his marital status, just as President Koroma’s failure to address these urgent issues facing ordinary people has not been as a result of his marriage. Most importantly, Julius Maada Bio is a young man who values his culture and tradition. And as a devout catholic who has taken the hand in marriage of Fatima Jabbie – a devout Muslim shows that Maada Bio symbolises a politician whose values cut across religions. He truly extols the virtues of our religious tolerance as a nation. To those who say that Julius Maada Bio is still legally married to Francess Bio and has therefore committed polygamy, that story for the record is factually incorrect. Julius Maada Bio and Francess Bio legally and amicably separated six years ago. But like every responsible and caring parents, they have always been in contact as they both contribute immensely towards the upbringing of their beautiful children. In point of fact, it is public knowledge that during the 2012 presidential elections, Francess Bio travelled to Sierra Leone to help campaign for Maada Bio’s victory. But the more pertinent question is: who is Fatima Jabbie-Bio? Fatima Jabbie was born to a Sierra Leonean mother – Tidankay Jabbie who hails from Kono district and a Gambian father – Umar Jabbie, who lived in Kono for many years as a business man, owning several properties in that part of Sierra Leone. Fatima Jabbie-Bio grew up in Kono where she attended the Ansarul Islamic School and later attended the St Joseph Convent Secondary School in Freetown. Through her maternal lineage, her late grandfather Alhaji Marabou Jabbie hailed from Kono, whilst her late grandmother, Isata Nabay hailed from Segbwema. Fatima’s deep rooted connection in Sierra Leone as a little girl growing up in Kono, is just as colourful as Fatima’s academic and professional career. As a very promising and determined young woman, Fatima Jabbie-Bio holds a Bachelor of Arts (with Honours) degree in Performing Arts from the Roehampton Institute in London. Her degree in Performing Art prepared her for a very successful career in the African Film Industry in London. She is one of the most elegant Nollywood Actresses and a talented scriptwriter and executive producer. Fatima Jabbie-Bio has starred in many Nollywood movies such as “Battered”, “Shameful Deceit”, “Expedition Africa”, “My Soul” to name but a few. She has acted alongside other famous Nollywood actresses including Genevieve Nnaji and Osita Iheme (Pawpaw) in the award-winning movie “Mirror Boy”. She wrote and produced her own movie “Battered”. Fatima has received several awards for her talent in the film and fashion industries, including “Miss Africa 2000” in the UK and “Best Supporting Actress” for the movie “Mirror Boy”. At the ZAFAA Awards 2011 in the UK, she also won “Best Actress Award” from the Black Ethnics, Fashion and Film Industry in the UK 2011. 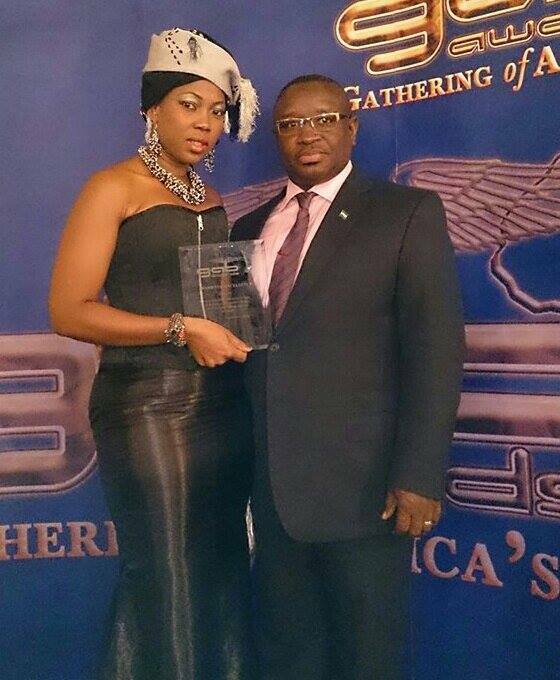 The Pan-African “Woman of the Year Award” was given to her by ‘All African Media’ based in Ghana, and in September 2013 Fatima Jabbie-Bio was voted the best female actress at the African Oscars in Washington DC, from a list of 32 nominees in Africa People’s Choice Best Actress category. Fatima won that award despite competition from other Nollywood superstars, including Omotola Jalade, Monalisa Chinda, Queen Amina and Ify Hollywood. And that is not all; very recently, on 27th October 2013, she won the Gathering of African Best (GAB) Awards for her exceptional contribution to promoting a positive image of Africans around the world. Her talent and contributions to the film and fashion industries have also been honoured and recognised by the Sierra Leonean Community in the UK in 2011, where she was awarded the ‘Best Dressed Actress’ and ‘Best African Breakthrough’ by the Sierra Leonean Excellence Award – UK. Promoting the Sierra Leone Film industry, she recently travelled to Sierra Leone to shoot the now internationally acclaimed “Ibu in Sierra Leone”, which was recently premiered in London, starring Desmond Finney, Collins Archie-Pearce and John Okafor (Mr. Ibu). Fatima’s charity work is also well recognised. She is a Patron Member of many charitable organisations in the UK, including the John Utaka Foundation which is helping African children and young people cope with mental and physical difficulties. Fatima Jabbie-Bio said: “As someone who is proud of Sierra Leone as my maternal home where I grew up, I have always looked forward to working with stakeholders in helping children and young people whilst at the same time continue to promote and support the Sierra Leone Film Industry – at local and international level”. 2014 will see Fatima Jabbie-Bio also completing another Bachelor of Arts degree in Journalism at the University of the Arts, London College of Communication. Fatima Jabbie is an important role model to young talented women in the creative industry of Sierra Leone, and her success is one that is worth emulating.